After a successful junior career, yet another Dallas Stars draft pick has joined the AHL's Texas Stars for the end of the season. Brett Ritchie, a second round pick in 2011, has been skating in practice this week with Texas and is excited to get started. "It was a quick transition," said Ritchie, whose Niagara club fell to Oshawa just last Friday to end his season. "I'm obviously here on the ice with a bunch of new guys. I'm excited to play this weekend." Ritchie is the rookie once again, a role he hasn't played since he was 16 with Sarnia in the OHL. However, he isn't completely out in the dark with regards to his new teammates. Many of these players have been teammates in Stars prospect camps if not the OHL. Jamie Oleksiak was a Niagara IceDog last season as they went deep into the OHL playoffs. The nineteen year old winger is a towering presence on the ice. Coach Desjardins had him playing on a unit with Mike Hedden and Justin Dowling in power play drills, indicating his potential location on Friday night. "I think you use players where their skill dictates," said Desjardins. "We'll probably get Ritchie to fill Alex Chiasson's role. That's a big role to fill because Chiasson has played well for us." Chiasson, of course, was one of four players recalled to Dallas yesterday. He, Colton Sceviour, Matt Fraser and Tom Wandell will all likely be spending the rest of the season in Dallas. However, Dallas wants Sceviour, Fraser and Chiasson to be available for the AHL playoffs. This means there should be a paper transaction today to have the players sent down and then called up after the deadline. "It's great to see them go up," said Desjardins. "It's a great opportunity for them. That's the nice thing. We're happy to make adjustments when that's the reason. It's not who's out of your lineup, it's who's in the lineup." Adding Brett Ritchie should help to alleviate some of the concern of losing some of their top players to Dallas. Ritchie does still need to adjust to the AHL's speed, which he has been working on all week. "As far as this weekend goes, I'm just going to work as hard as I can in practice to show I'm ready to play." There are still some things potentially to sort out at the deadline. However, today the Stars had eleven healthy defenseman on their roster and ten on the ice. Gaunce was still in transit from Toronto, where Lake Erie is playing today. "We have lots of guys but it's a good thing," said Desjardins. "We're not too focused on what exactly we have now because the deadline is still to come." On the defensive depth, Texas has some juggling to do. 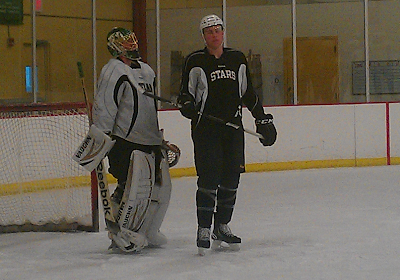 Mike Commodore is coming along and the Stars want to get him into the lineup this weekend. "It's great to have depth at defenseman. It's a hard position to fill, and it's a luxury to have it. It's great for us right now. We still have a lot left to happen." Patrick Nemeth is also a full participant in practice but still might need some adjustment time to get back in the swing of the game's physicality. You'd like to give him a game as well if he can handle it. "Guys are going to get into our lineup; they're not going to be at the top of their game, and we have to understand that. It doesn't mean they won't get to a different level, but sometimes that takes time and you need playing time to get there." Cristopher Nilstorp looked good in practice and I would bet he gets a start this weekend, probably at home against Hamilton. "We'll wait and see on the injury right now. The plan is that he'll get in but it will take a bit more before we know." 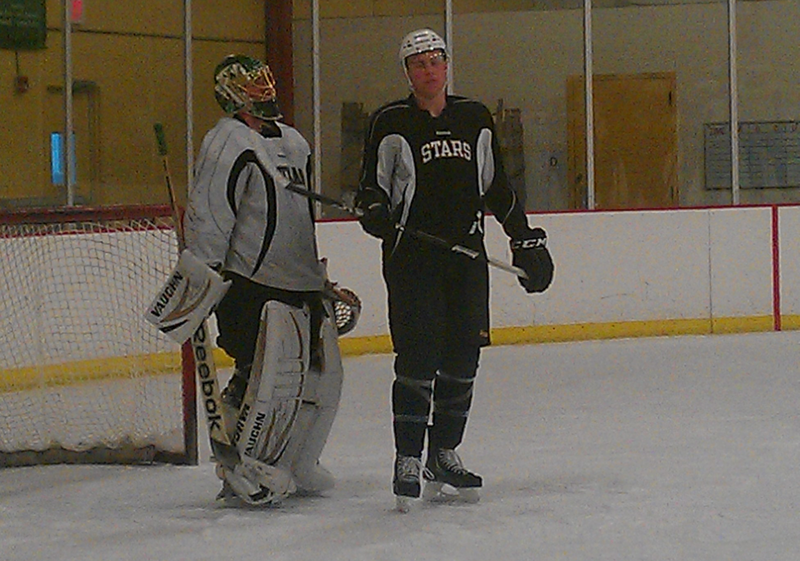 Also on the ice for Texas but not yet officially announced as signed were Curtis McKenzie and Brock Montgomery. Good post, lots of info. I get the call-up thing but I don't get how then they expect to bring a team together for the playoffs that hasn't been playing together for the last few weeks of the season. Seems careless. Doing a quick check of the "active" players, we have 7 centers, 4 left, 5 right, 2 goalies and TWELVE d-men. I can understand having a few back-ups and centers can always play wing, but that still seems like WAY too many d-men. Are they going to send some to Idaho or just release them? I'd hate to see the guys who have been working so hard get cut before they go to the playoffs!